Yesterday, Tuesday 28 July, was the deadline for the Maltese government to submit their justification to the European Commission for reintroducing the trapping of wild finches in autumn 2014 and BirdLife Malta is urging the government to ban the practice rather than risk Malta facing the EU Courts. In a statement, Birdlife said the government has already received two formal warnings from the European Commission on the matter and if the justification submitted today is not adequate, Malta will soon be facing lengthy and expensive court proceedings at the European Court of Justice. If this happens, an interim court junction will force trapping to be suspended for the duration of the case. On the eve of the second formal warning in May, the Ornis Committee, the government’s advisory body on hunting and trapping issues, made a recommendation to approve trapping again this autumn. While legislation permitting a trapping season for autumn 2015 has not been published, a ‘notice for trappers’ posted on the FKNK forum is a clear indication that the government intend to forge ahead with an autumn trapping season regardless of the likelihood of legal action (5). The notice, posted on 18 July, informs trappers that, as ‘agreed with the Department of WBRU [Wild Birds Regulation Unit]’ the application process for trapping licences is now open. Trappers may obtain licences, allowing them to catch up to 10 finches across four trapping sites, for just €55. BirdLife Malta said it has submitted a detailed report to the European Commission on Malta’s decision to reintroduce finch trapping, listing not just bird conservation issues but also a barrage of practical problems enforcement authorities have faced during the season, as well as the impact trapping has on the countryside and other wildlife, among the various reasons why trapping should finally be outlawed. The notice on the FKNK forum also states that the WBRU has agreed to allow registration of new trapping sites, a move which will have a serious negative impact on the Maltese countryside. The preparation of trapping sites involves removing all the vegetation, often using persistent herbicides or burning the ground, which leads to habitat loss, soil degradation and land erosion. “We have seen large patches of the countryside scorched and burned in preparation of last year’s season. Over 8,000 trapping sites were active for a whole 2 and a half months last year – the impact of some of these has already been permanent – we need to reverse this impact, not increase it” continued Nicholas Barbara. The European Commission has made it clear that they do not accept trapping and keeping of wild finches for enjoyment to be a suitable reason for breaking EU law. 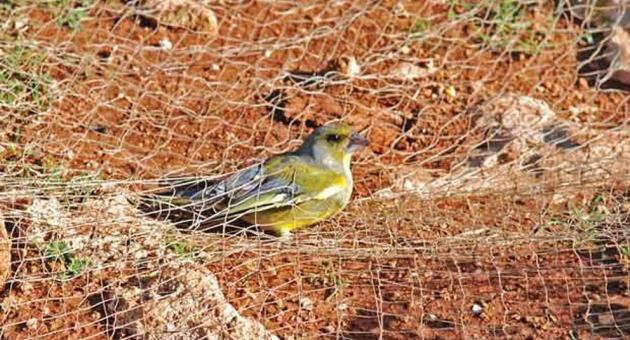 Karmenu Vella, European Environment Commissioner, declared last month, “I think that Malta should put an end to finch trapping. We have already started legal procedures … and Malta should abide by the regulations”. it really is beyond comprehension that this barbaric practice is allowed to continue in a so called civilised country in this day and age. This along with the equally horrific practice of shooting everything that flies over Malta during migration makes Malta and its pathetic government pariahs. The everyday holiday maker should be made aware of these horrific practices before visiting, it is only loss of revenue that will force these people to stop their senseless slaughter. A campaign urging people to look elsewhere for their holiday will soon bring this practice to halt. I will never visit Malta or for that matter Cyprus until this practice ceases.